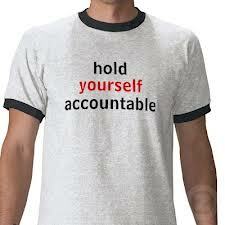 Of the 60+ blogs written by John and I, we have covered Accountability (A of FACTS) the least. It’s a difficult topic, and there is little research to draw on. Often articles on accountability relate to corporate accountability and sustainability. This is where corporate accountability aims to ensure that a company’s products and operations are in the interests of society and are not harmful. But with on-going business malpractice, corruption and fraud, is this more than PR in glossy brochures for shareholders? Where does the individual fit into this? How do we promote accountability and raise individual standards one conversation at a time? Also, an NGO report to the UN Commission on Sustainable Development in 1997 recognised the situation in which companies and employees are held prisoner by the competitive demands of the economic system and forced to choose the bottom line. So there seems to be something fundamentally wrong with the ‘system’ that prevents accountability being higher on the agenda of individuals within organisations. When talking about ‘organisations’, and ‘companies’ these seem to be large systems that cannot be easily changed. However, I am reminded of the famous Margaret Mead quote which says “Never doubt that a small group of thoughtful, committed citizens can change the world; indeed, it’s the only thing that ever has.” Through one conversation at a time the system can be changed and the matter of accountability addressed. Often the subject of accountability arises when there is a failure; performance has fallen below the agreed level, a person has failed to deliver to a deadline, etc. This is corrective action, holding employees answerable for their decisions, actions, and behaviour. But this is after the event and only when there is a problem. So how can accountability be used as a positive guide for behaviour and performance rather than a mechanism for blame? An interesting interpretation was provided to me when a colleague said accountability is being able to count on someone. This is a more positive view of the behaviour that is present rather than something which is absent. Think of the people you can count on, what do they do? You can probably add further characteristics of people you count on. If someone role models these characteristics, then ‘preventative accountability’ is evident. The presence of these attributes means that obligations are fulfilled and post-event corrective action is not required as failure is avoided. Therefore, accountability comes one conversation at a time, and happens through individuals developing characteristics so you can count on them. Who do you count on and why?